Project area B focuses on individual process steps including reaction, separation of solvents and purification of products and co-products for the reductive amination and hydroaminomethylation of long-chain aldehydes and olefins, respectively. Innovative apparatuses and new tools for performing reactions in and enabling separation of liquid-liquid multiphase systems are developed, especially with respect to thermomorphic multiphase systems (TMS), micellar solvent systems (MLS) and particle stabilized emulsions (Pickering emulsions). 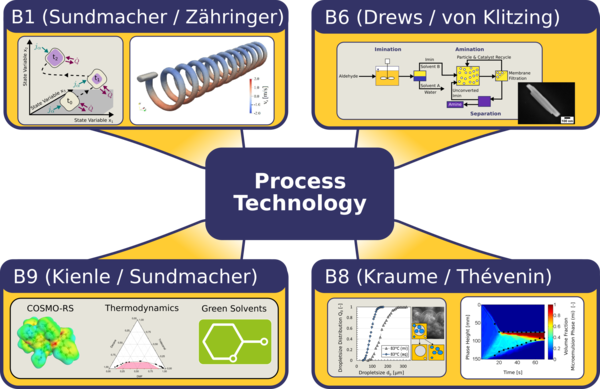 In particular, the systematic design of reactor-separator-networks, the efficient separation of polar substances from pickering emulsions, the quantification of the decomposition process of MLS and a model based framework for the integrated design of TMS and corresponding separation strategies for the recovery of homogeneous catalysts and solvents from the reaction mixtures are investigated. Project area B strongly collaborates with project area D for integrated process development, enabling synergy effects with respect to mathematical model descriptions, tools for process design as well as experimental investigations on lab and miniplant scale.